It was a frosty start for the third and final day of the TAFE NSW Women’s State Cup held at Lake Macquarie Regional Football Facility, with Herald Women’s Premier League (WPL) side Adamstown Rosebud JFC taking home the title for 2018. 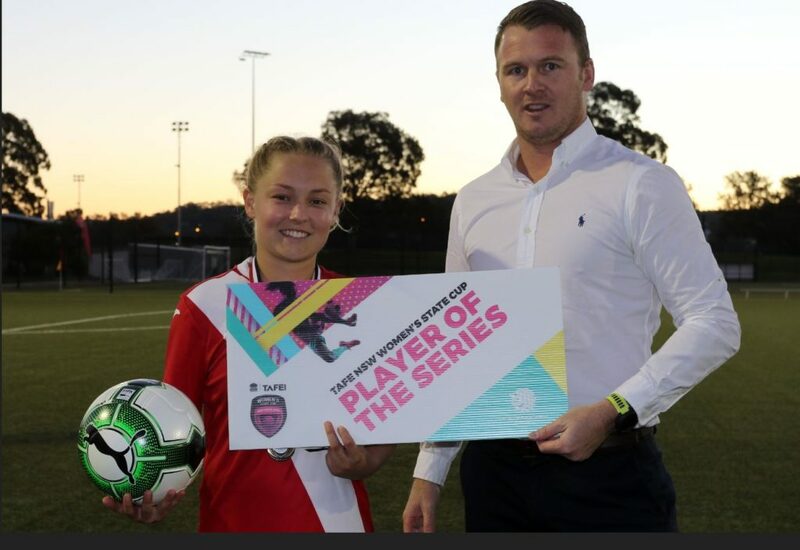 Libby Copus-Brown from Herald WPL side Wallsend FC was awarded the TAFE NSW Player of the Series due to her goal-scoring efforts and consistently strong performance throughout the competition. Fellow teammate, Sophie Milton was awarded TAFE NSW Player of the Match from her Semi-Final performance against Football Mid North Coast. Rosebud Maggie Quinn was also announced as TAFE NSW Player of the Match after an impressive game against Herald WPL opponent South Wallsend JSC. The morning kicked off with the first quarter-finals between Herald WPL sides Wallsend FC and New Lambton FC, and Herald WPL sides South Wallsend JSC and Warners Bay FC. It was a competitive game with Southy ending up on top through a fifth minute strike from Gabrielle Brodie. Into the second half, the defending TAFE NSW Women’s State Cup champions Warners Bay, came out strong trying to find the equaliser but Southy keeper Jessica Sanderson saved all attempts. Despite Warners Bay’s best efforts, the score at full-time remained 1 nil. 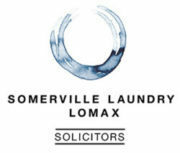 New Lambton saw a 2 nil lead slip, as they went down to Wallsend FC in a penalty shootout. The next set of quarter-finals, saw Under 20’s Herald WPL side Football Mid North Coast face off against Barnsley United FC, and Herald WPL sides Adamstown Rosebud JFC up against Merewether United FC. Football Mid North Coast continued their form from the Group stage, with a commanding 5 nil victory over Barnsley. Emma Pearson and Madeline Owen each picked up a brace with Jessica Terry and Jenna Doyle rounding out the scoresheet. On field 2, Merewether United opened up the scoring with a penalty to Rebekah Stuart midway through the first half. The Rosebuds hit back on the stroke of half time, with a stunning strike from Lauren Allen. The score was held to 1 all at full time, with the Rosebuds running out winners after the penalty shootout. The Play-Off rounds were next, with the teams that failed to qualify the quarter-finals on Day Two taking to the field. An under-manned University Women’s FC side couldn’t keep out Mayfield United SFC, who took home a 5 nil win. On field 2, Boambee Eagles began the brighter of the two teams, troubling the defence with Kylie McDonald and Siobhan Deam creating a number of chances. However, it took them until the second half to find the back of the net, courtesy of Kathleen Vail in the 35th minute. 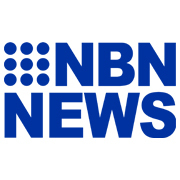 The game looked destined for a Boambee victory until Redbacks player Alexandra Field unleashed a stunning long-range effort, sending the game into penalties. The momentum was with the Redbacks as they went on to win 5-4 on penalties. The Semi-Finals saw Wallsend FC and Football Mid North Coast, and South Wallsend JSC and Adamstown Rosebud JFC fighting for a place in the TAFE NSW Women’s State Cup Final. Wallsend FC opened the scoring in the 7th minute with a classy finish to TAFE NSW Player of the Match winner, Sophie Milton, followed shortly by a free kick from TAFE NSW Player of the Series winner, Libby Copus-Brown. Football Mid North Coast had their chances in the second half, however their TAFE NSW Women’s State Cup run fell at the final hurdle. The Semi-Final on field 2 saw South Wallsend creating the first attacking threats of the game but the Adamstown defence held strong. Southy’s best chance came from a shot outside the box by Gabrielle Brodie that sailed over the crossbar. Despite Southy’s attacking dominance, it was the Rosebuds who opened the scoring thanks to TAFE NSW Player of the Match winner, Maggie Quinn, in the 20th minute. Rosebud Lauren Allen settled the score in the second half, finishing a cross from Annika D’Amico. In the third Play-Off game of the day, it only took Cooks Hill United FC one minute to take the lead by Rachel Calligan followed by Renee Valentine in the 14th minute. A Natasha Scott goal reduced the deficit to one, however, Kurri Kurri Women’s FC were unable to find a second. 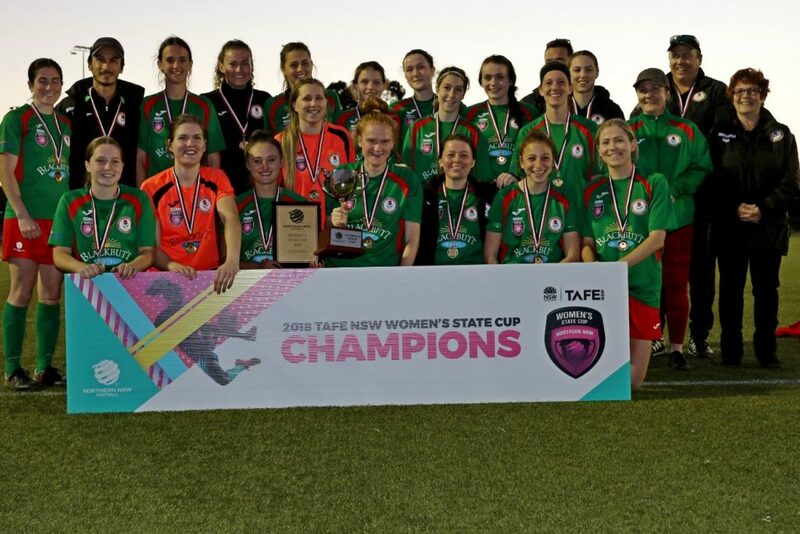 The TAFE NSW Women’s State Cup final saw two Herald WPL clubs, Wallsend FC and Adamstown Rosebud JFC looking for their first title. It was a tight affair from the opening whistle as neither side could assert their authority, but Annika D’Amico slotted home after a corner wasn’t successfully cleared by the Devils. Georgia Little proved to be a handful for the Rosebuds backline, forcing keeper Natalie Wiseman to make a spectacular save. The resulting corner, nearly saw Georgia Little scoring off a bicycle kick, but was unable to make significant contact. Rosebuds doubled their lead just after half time as youngster Callie Thomas tapped in a deflected shot from Lauren Allen. Olivia Trinka sealed Adamstown’s TAFE NSW Women’s State Cup title win from a fantastic cross from Lauren Allen. The final whistle blew and Adamstown Rosebud JFC were crowned TAFE NSW State Cup Champions and awarded the trophy by Northern NSW Football Chairman Bill Walker, and Community Football Manager Peter Haynes. It was clear blue skies and sunny conditions for Day Two of the TAFE NSW Women’s State Cup. Teams from Group A and Group C started the morning off with a community football clash between University Women’s FC and Boambee Eagles, and a close call between Merewether United FC and Cooks Hill FC. Continuously putting pressure on the University defence, the Eagles hit both posts and the crossbar in a strong start to their TAFE NSW Women’s State Cup campaign. The Eagles scored in the 3rd minute through Jasmine Kruger, after dominating the early possession. Using their strong forwards to their advantage, Kylie McDonald secured a hat-trick within the space of nine minutes to give Boambee a 4 nil lead at the half time break. The second half saw a few chances for the University Women’s side to get their name on the score-board, but they could not deliver. Boambee Eagles rounded off the scoring in the 49th minute with Siobhan Deam, securing an impressive 5 nil victory over University Women’s FC. Herald WPL defending Champions Merewether United and community football team Cooks Hill United kicked off Group C in a tight game, with Cooks Hill taking a shock 1 nil lead in the 11th minute through Lulu Suter. Cooks Hill continued to come out strong with Emma Gelling creating a number of chances, but Merewether keeper Taylah Gray held her ground. Merewether equalised shortly before half time thanks to a goal by Lori Depczynski. Cooks Hill ramped up the defence after the break as Merewether encroached into their territory for the majority of play, but Merewether forwards were unable to find the killer blow. The game look destined to lead into a penalty shootout until Freya Clifton managed to poke through the strong backline five minutes from time. Depczynski then made an excellent one-on-one shot that was deflected by Cooks Hill keeper Jordana Stavros, making an great save. 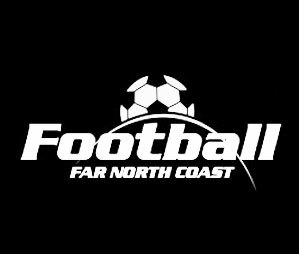 A highlight throughout the day saw the Herald WPL Under 20’s Football Mid North Coast (FMNC) side dominate the defending Herald WPL Champions Merewether United scoring three (3) unanswered goals. FMNC made it two from two, toppling Cooks Hill United FC, thanks to a late own goal. This result puts them at the top of Group C, placing them in a good position to start on Sunday for Day Three of the TAFE NSW Women’s State Cup. Later into the day, Westfield Matilda Gema Simon started the Group B encounter against Mayfield United FC, as Southy looked to continue their impressive start to the TAFE NSW Women’s State Cup. Simon immediately impressed, setting up Mary-Jane Mason for the opening goal, who scored again shortly after. Mayfield had their opportunity early in the second half as they broke the solid Wolves defence, but Southy keeper Jessica Sanderson managed to push it aside for a corner. The game remained end to end throughout the second half, with Simon nabbing the Wolves their 3rd goal for the game. Group D teams Adamstown Rosebud JSC and Kurri Kurri Women’s FC started off with early shots from the Rosebuds that fell wide of the goal. With Kurri Kurri struggling to get out of their own half, Olivia Trinka had a shot on goal, but Kurri Kurri keeper Kali-Mae Anderson managed to palm it away. A cross from Olivia Trinka wasn’t cleared by the Kurri Kurri defence, allowing Annika D’Amico to place the ball in the bottom corner. Kurri Kurri fought back with Simmone Wetzler taking a long range shot but it didn’t trouble the Rosebud keeper. Into the second half, Belle Hewitt scored from outside the box with Rosebuds continuing to maintain possession of the ball resulting in a further 3 goals. The Knock-Out Finals Series will take place on Sunday 15th July from 9:00am with the top two teams from each group playing off against each other in a three phase finals series (quarters, semis & final). The remaining teams who do not qualify for finals series will play-off against the corresponding placing team from another group throughout the day. The NNSWF Women’s State Cup Final will kick off at 4:00pm on Sunday afternoon. Friday night saw Day One of the TAFE NSW Women’s State Cup kick-off featuring six (6) of the local teams from three (3) different groups in cool conditions at Lake Macquarie Regional Football Facility (LMRFF). The first two (2) matches of the night featured Herald Women’s Premier League (WPL) sides, Warners Bay FC and Wallsend FC, and New Lambton FC and South Wallsend JSC. It was a tight affair for the start of the TAFE NSW Women’s State Cup, with defending champions Warner’s Bay missing out on a win to Wallsend. Wallsend took advantage of an under-strength Warner’s Bay side, with Sophie Milton scoring within the first 5 minutes of the second half. The Panthers hit back with Sophia Laurie making it one (1) all in the 41st minute and at full time the two (2) Herald WPL sides could not be separated leading into a penalty shootout. Danielle Redding saved the Devils denying Westfield W-League Tara Pender’s penalty kick. South Wallsend dominated from the start, with the first goal coming from Westfield Matilda Gema Simon in the eighth minute. Mayfield United took the early lead with Melissa O’Dell finding the back of the net but Thornton were awarded a penalty just before half time evening up the score. The game was at a deadlock with the full-time whistle blown to bring the competition to another penalty shoot-out for the evening. The Redbacks dominated Mayfield United securing a 4-3 victory after penalties. Adamstown Rosebud JFC proved to be too strong for Barnsley United FC with a number of their players on the score-sheet securing a massive 8 nil win. 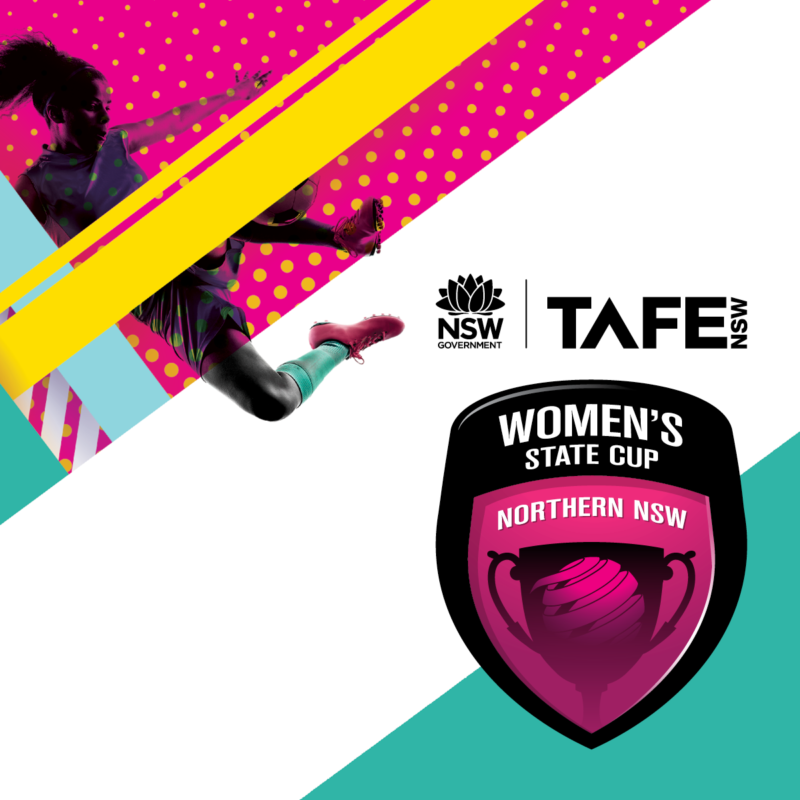 Day Two of the TAFE NSW Women’s State Cup resumes tomorrow at the LMRFF with first kick-off at 9am. University Women’s FC take on North Coast Football side Boambee Eagles FC field 1, whilst Herald WPL giants Merewether United FC face off Cooks Hill United FC.